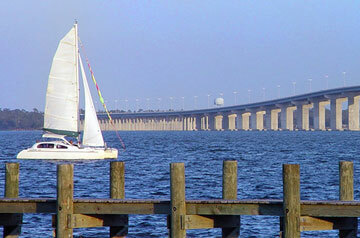 Bay St. Louis is a charming city located on the the highest point along the entire Gulf Coastline. The homes are a combination of classic Victorian cottages and new construction that has been springing up since the impact of Hurricane Katrina in 2005. Situated along the Mississippi Louisiana border, Bay St. Louis is a prime destination for visitors from the greater New Orleans area or those looking to retire to a quieter neighborhood by the beach. There are a number of different housing options in “the Bay” as residents of Bay St. Louis refer to their hometown. From luxury beachfront homes, quaint vacation cottages in the historic “Old Town” neighborhood, to waterfront property with access to boating on the St. Louis Bay and Jourdan River. With a population of just over 10,000 people, Bay St. Louis has a mix of full time residents and second home vacationers that help to maintain a vibrant downtown and tourist scene. Recently, the Bay completed construction of their new Downtown Marina adding to the numerous water activities in the area. With several marinas, public piers and boat launches, Bay St. Louis provides a number of options for the avid sportsman. In addition to fishing and boating activities, the Bay St. Louis area has Buccaneer State Park, Hollywood Casino featuring the Bridges Golf Course and the NASA Infinity Space Center and Museum.